Eric Geiger continues his 2013 Discipleship Interview Series with Trevin Wax below. Trevin serves as the managing editor of The Gospel Project and is a prolific blogger. Discipleship is such a broad term, often a junk-drawer term that has been used to describe many things. How do you define it? There are elements of discipleship that need to be stressed today, as they were stressed in Jesus’ teaching. For example, in many of His parables, the portrait of a disciple is one who joyfully renounces some of the most precious things in this world for the sake of the kingdom – a treasure more precious than anything else. There’s a picture of joyful sacrifice at the heart of discipleship. We also see a number of examples in the Gospels where discipleship could be defined as “knowing what time it is.” In other words, living on earth as citizens of heaven, looking at the world in light of the coming Day of Judgment and bringing our lives in line with that reality. How do you articulate the holy tension in God’s role in transformation and the believer’s role? I don’t believe we should look at transformation as if it were a “tension.” Rather, God is working in us and through us to accomplish His good purposes for us and for the world. It’s not “Let go, and let God,” because the Bible clearly teaches we are to put forth effort in our spiritual growth. And yet, the message isn’t “Just try harder” either, because the Bible clearly teaches that our efforts are Spirit-driven. I think we get off track in this area when we make conceive of Christian obedience more in terms of “life for God” than in terms of “life with God.” Put another way, it’s our life with God that undergirds and empowers anything we do for God. Obedience takes place within the context of relationship. Do you see distinction between personal discipleship (a believer on his own) and corporate discipleship (a believer does in the community)? I wouldn’t call it a distinction, but different elements of the same thing. We tend to stress personal discipleship today – the image of a Christian on their knees in private prayer or reading the Bible quietly in the morning. Private prayer and Bible reading are important elements to our growth, of course, but let’s not underestimate the power of growth within the Christian community. Loving one another. bearing with one another. Forgiving one another. Serving one another. Witnessing with one another to the lost. Singing together. Etc. There are many “one-another” passages in the Bible. Growing spiritually means fulfilling those passages. Without the Christian community, how are we able to obey King Jesus in this area? In your mind, is discipleship one aspect of church ministry or the totality of all a church does? 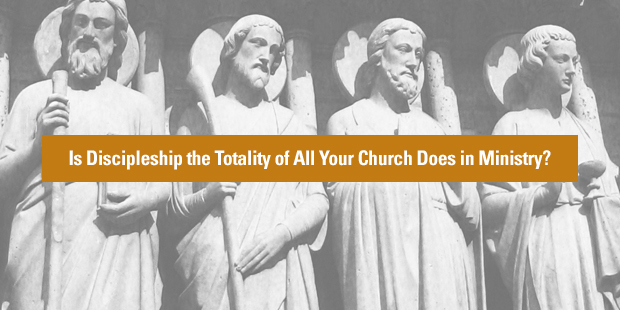 It is the totality of all a church does. The formation of disciple-making disciples should be at the heart of everything we do. Discipleship is not implementing a program, but imitating the Savior who empowers us by His Spirit to engage others with the gospel.